The Hotel is One of the Symbols of Bansko With a Unique Location in the Town Centre. It is Famous For the Good Service and Friendly Atmosphere. It is a Favourite and Preferred Place For Year-Round Relaxation and a Holiday For a Great Number of the Regular Visitors To the Resort. Comprising a Total of 68 Guest Rooms, the Establishment Features 24-Hour Reception and Check-Out Service, a Hotel Safe, Currency Exchange Facilities, a Cloakroom and Lift Access. Guests Also Have a Games Room, Caf? ?, Bar and Restaurant At Their Disposal. 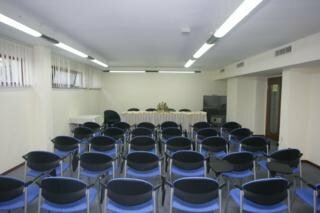 Business Guests Are Sure To Appreciate the Conference Facilities. For Additional Fees Guests May Take Advantage of the Room and Laundry Services and Bicycle Hire. Those Arriving by Car May Leave Their Vehicle in the Car Park.